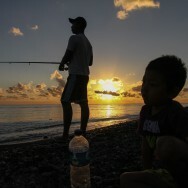 Budakeling is a town in the east of Bali, somewhere along the road between Amlapura and Amed. 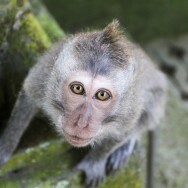 The town owes it’s name to the Buda sect which founded it’s first monastery on Bali here. I am told it’s a mix of Hinduism and Buddhism, but Balinese style. 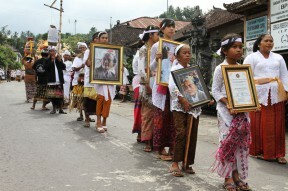 One of their gurus has passed away several months ago and today is the cremation ceremony. Up to that point the body has been embalmed and kept in her house. She was born in 1901 and knew everyone by name until the day she passed away. It becomes quite obvious along the way that this is a big happening. People I meet on the road that are headed the same way wear the traditional sarong and headband as is custom with these ceremonies. Thousands have come to attend, some from as far away as Jakarta. There are several monasteries around a square which holds a big cow statue in which the body will be placed. I am reminded of Burning Man when I look at the statue and hear music playing from one of the monasteries, very similar to that which played in the Temple at Burning Man in 2011. I’d be reminded again, later, once the cow statue is lit on fire. After I arrive I strike up a conversation with Igede, a fifty year old television consultant operating out of Denpasar as a freelancer. Next to him sits Made, with a large camera. They are here to film the ceremony. Coincidentally, one of Igede’s brothers is there and happens to be one of the police officers that stopped me over and had me pay a bribe to continue on a couple of days before. He says he doesn’t remember, they talk in Bahasa for a bit and the officer says sorry, shakes my hand and tells me there will be no problems in the future. I am his ‘friend’ now. I shrug and continue my talk with Igede. We joke that by paying the bribe I had most likely contributed to the costs of the ceremony too. Igede prays to Jesus every morning. He goes to church in Denpasar about once a month but the people there tell him he’s not a good Christian. He tells me he doesn’t care. He feels we have become trapped in religion and that modern day religion has little to do with the teachings of the religions prophets and gurus. He feels the church has done the same to the teachings of Jesus as the Jews did to Jesus himself. That’s why he believes in Jesus, but not in the church. He goes there only to meet his fellow Christians. As the procession starts, a group of muslim men come around the corner and join in, playing instruments and chanting as they lead the procession to the cemetery. I ask him why the muslims would join a procession for a Budist guru and he tells me that the guru was a guru to all the people in Budakeling and everyone comes to give their respects. 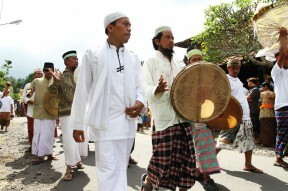 The Balinese muslims are under pressure from Muslims from other parts of Indonesia. They are told they aren’t strict enough and should stop with the Balinese songs and play the traditional music and songs from the Islam. 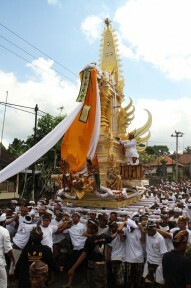 Igede thinks the Balinese Muslims should function as a role model for Muslims around the world. The procession continues, thousands of people take part and several structures are carried on the backs of people, in between them musicians, dancers and mourners walk along. One of the structures is a giant statue of a cow. Another is a tall, high statue which carries the body on top of it. Once at the cemetery, the stairs will be used to reach the top of the tall structure, carry the body down and place it in the cow at which point people can come bring their final offerings and place them in the cow alongside the body. This process takes a while and Igede and I talk some more. He tells me he has opened an arts center in Denpasar where artists come from all disciplines and religions to create and discuss work. Traditional music from various religions, dancers, painters, everything comes together. It’s work for him too, but it doesn’t feel like it so much. We’ve become trapped he tells me. Religion is a trap, even this ceremony today is a trap. You can attend, but you shouldn’t become trapped in it. I ask him if he still has any dreams left in life after seventeen years of television work, his own freelance television company and operating his own arts center. He tells me his big dream is that everyone becomes free, no longer trapped in various belief structures and ideas but truly free. That, he tells me, is the most important thing for people in life. What you believe today might not be true tomorrow, getting trapped in what you believe is dangerous. Doubt everything. I tell him I find the whole cremation ceremony rather celebratory. He says it is about sadness and happiness at the same time. It is sad to see someone pass away but it is also joyful because our existence on earth is only temporary. We do not belong here. 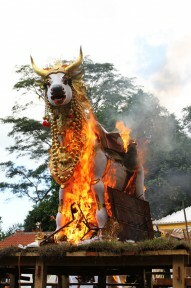 A small shade structure that was placed over the cow is carried away and gasoline is being poured on the structure as the cow is being closed again, the body and final offerings inside. Igede nods towards the structure as he motions skywards with his hand. “Ready for take off,” he winks as the flames begin to rise.